A sweet milky white chocolate aroma gets to you when you open the wrapper. There is an unfamiliar by-smell I cannot really identify. All in all, a scent that could be better! The chunky consists of five layers of wafers and four small layers of cocoa crème. All this is coated in a for a chocolate bar untypical thick layer of white chocolate. The chocolate is creamy and, of course, milky. It definitely dominates the flavor of the bar, but you can still taste the wafers and the cocoa crème filling separately. It is as sweet as you would expect white chocolate to be, but it doesn’t get too sickly. 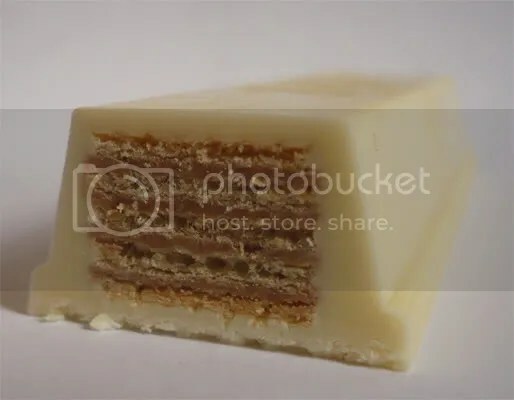 The texture is mid-crunchy in the beginning, but gets a little more creamier during the chewing process while the white chocolate melts in your mouth. The easily crumbling wafers and the chocolate make a great mixture and blend very well. 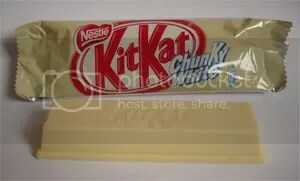 I like the fact that the chunky kitkats do not have the added portion of crunch which Nestlé added to the usual kitkat. The bar is pretty decent, but it is not the best chunky. I prefer it to the original version, but the bars containing some liquid filling are way better and more versatile when it comes to their texture.